I think I was 7 or 8 and the game was either Spider Man or PitFall on Atari. I've no idea. I have vague memories of PerfectDoak showing me how to load a game in DOS. Also of the Acorn Electron. Presumably I would have started playing games as soon as I knew how to. I would have to assume that the first DOS game I played would have been either Alleycat, Sopwith, 3-Demon or Rogue as those are the oldest ones we had. If it was the Electron it probably would have been Snapper. I have been to actual arcades, and remember how dark it was compared, to now. Nowadays arcades are just Japan wanna be replicas. No Mole Machines, ski-ball, tickets, or anything of that sort. Then their was Word Muncher, Math Blaster, and Dave. I only got into videogame as a consumer since, I was playing with my cousins. That was when I started to go down that horrible path of Nintendo, being a Ninten-doh person was the downfall of my life. Only recently I decided to kick the habit, of Nintendo, because they could have made the blasted add-on for the GCN, but they did not. I am more of a Comic book person nowadays. I really hate the comic industries for trying so hard, to get gamers. They know we have money, and they know we have benifits. They want to take advantage of our peacefull way of living. The DOS era is where it is at. In fact what is stupid is how we all should have been hooked on Linux, or Amiga but we were not. In fact, that poster above me. 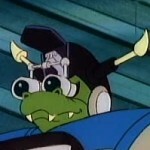 I remember when Koopa was Koopa. I ordered that Vhs from scholastic a long time ago, as well. We got that instead of getting Time Bokan.